White is a positive color, associated with purity, innocence, spirituality, safety and protection. The white color affects the mind by aiding in mental clarity, promoting feelings of fresh beginnings and clearing obstacles and clutter. 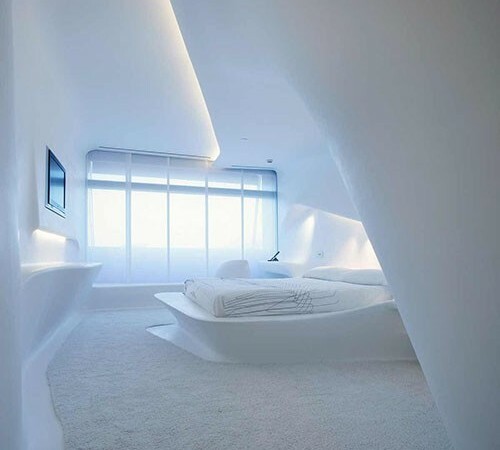 White color can be used in your bedroom interior, if you want the room to look spacious, clean and safe. Choose a white color scheme for your contemporary bedroom. This will make the room look and feel bigger and brighter. You can design a modern bedroom in white by choosing contemporary furniture with simple and stylish design, clean and elegant lines, and sleek, glossy surfaces. This is a great choice for small bedrooms, to create the illusion of more space. Decorate the room with white linen curtains, which will let in more natural light, while ensuring privacy at the same time. To make the room look more dynamic, you can place a few decorative objects in some other, neutral color. You can also furnish and decorate a minimalist bedroom in white. Minimalism can be really charming in your bedroom interior. The natural beauty of each piece of furniture and art will stand out, with less clutter to wade through and mentally process. Choose fewer furniture pieces with elegant, modern design and no decorative elements. Consider which furniture pieces can be removed from your bedroom, without sacrificing comfort. 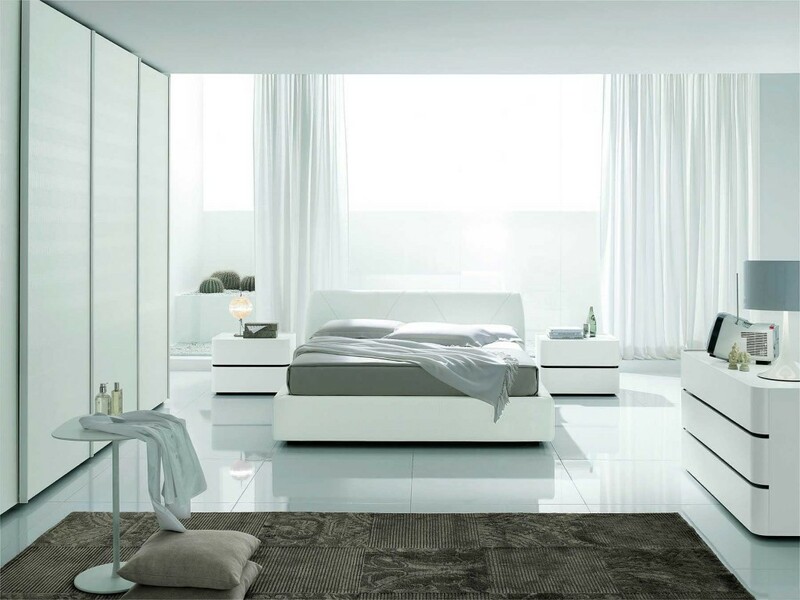 Solid white is a perfect choice of color for minimalist bedroom furniture. Also, remove all the small details and decorations and leave clear, flat, white surfaces. White is a great choice of color for the design of vintage bedrooms, too. You can make your vintage white bedroom look like the ones you see in interior design magazines. Choose white flooring and place a white, shaggy accent rug. Go for white bedroom vintage-style furniture and decorative elements. You may not know this, but there are different shades of white like stark white, silk white, ivory and deep ivory. A combination of a few of these shades of white is a great choice for a vintage bedroom. 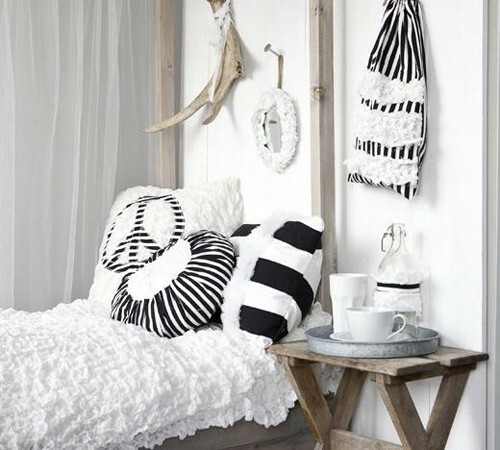 You can use white as the main color scheme for a rustic bedroom. Choose white shades for the walls, the floor and the ceiling. Go for furniture, made from natural materials like wood with white or very light finish. Canopy beds are a beautiful solution for a rustic bedroom. Decorate with hand-crafted pillows, hand-woven accent rugs and lace bed covers. White is a great choice of color, to create a dreamy bedroom, perfect for relaxation. This may not appeal to everyone, but this intentionally muted design palette, with no noticeable punches of bright colors, works really well. If you’re a fan of the industrial style of interior design, you can use it to furnish and decorate your white bedroom. It is a beautiful combination of art and engineering. Choose wallpapers that imitate white concrete surfaces or bricks. Hard wood or concrete floor is also a great option. Select furniture with exposed rough surfaces. Wooden surfaces without finishing and shiny metals like stainless steel or aluminum can help you create that industrial-style effect. Today, the industrial design becomes quite popular. At first glance, it may not seem elegant, but it is spectacular in the way different elements are combined and used for purposes other than their original purpose. Initially, the industrial style was used for kitchen decoration, but you can successfully use it for the bedroom, as well. If you want a bedroom that’s bright, light and fresh, go for a white color scheme. This will help you create a clean and calm sleeping space, which feels airy and light. White can open up the smallest spaces and bring cohesion to large rooms, filled with furnishings. Bedroom Design bedroom, bedroom design, bedroom interior, decoration, furniture, white. permalink.